Industriales made short work of Cienfuegos in their opening Occidental League quarterfinal series, taking three straight road matches at Cinco de Septiembre Stadium to put an early end to the Elephants’ post-season hopes. In Monday evening’s final series game the visiting Lions rallied from an early 3-1 deficit with a three-run uprising in the fifth and two more game-icing tallies in the sixth. Southpaw Ian Rendón hurled seven strong frames for the winners and shortstop Raiko Oliveras proved the offensive hero with four RBIs (coming on two sacrifice flies and a pair of run-producing singles). Yasmani Tomás – the hottest Industriales batsman throughout the entire series – provided the club’s only pair of extra-base hits (both doubles) while Juan Carlos Torriente, Carlos Tabares and Frank Camilo Morejón also chipped in with multi-hit games. Cienfuegos starter and loser Noelvis Entenza (the club’s only winner back in Game 2) lasted 5.2 innings and Pavel Quesada (triple) produced the only extra-base hit for the Elephants. Industriales will now sit idle until May 7 awaiting their opening semifinals series lid-lifter with the Sancti Spíritus-Matanzas series winner. Player of the Day: Raiko Oliveras with four RBIs lifts Industriales into the semifinal playoff round. Villa Clara also took an important step forward on Monday with a road victory in Bayamo. The Orangemen gave starter Freddy Asiel Alvarez plenty of support with a 19-hit attack that produced runs in every inning but the first and eighth. Every Villa Clara position player produced at least one safety and Andy Zamora led the charge with a four-for-five evening and a pair of RBIs. Andy Sarduy produced the only homer for the visitors while Urmanis García and Luis Ferrales produced solo round-trippers for the home club. Losing starter Ciro Silvino Licea worked into the fifth before surrendering to three ineffective relievers who did little to stem the Villa Clara onslaught. The victory moves Villa Clara into a three-two series lead and assures that the Orangemen will now return to home soil for the final one or two games of the series. Meanwhile Matanzas got back on track at least temporarily in Sancti Spíritus with a 5-0 whitewashing that cut the Gallos series margin back to a single game. Matanzas starter Jorge Antonio Martínez worked into the ninth frame, striking out eight and allowing only three harmless singles from the inept Sancti Spíritus offense. Relievers Yoanni Yera and Felix Fuentes each struck out the only batter faced during ninth-inning mop-up duty. Gallos starter Angel Peña failed to reach the third inning and was tagged with the loss. 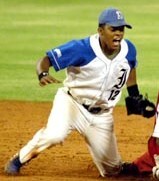 Shortstop José Miguel Fernández was the hitting star for the rebounding Crocodiles with a perfect four-for-four outing that included a homer and a pair of RBIs. The fourth match on Monday was cancelled by rain in Ciego de Avila – the second washout of that final Oriente League series. Las Tunas will still hold a slim 2-1 advantage when action finally resumes and the postponements have clearly aided Ciego manager Roger Machado who had to hold out ace starter Vladimir García until Game 3. Since Machado often uses Garcia on short rest he may now be able to get two additional starts from his top hurler if the series does extend to six or seven games. Games originally scheduled for Tuesday, May 1 (the two matches in the Occidental League) have now been cancelled, due to island-wide May Day celebrations. The three remaining quarterfinal series will continue Wednesday evening.